• Plus/minus change sign key. • Selectable decimal point: F, 4, 3, 2, 0, A. • Solar/battery powered: LR54 (included). For convenient calculations and a range of useful functions, the Aurora DT303 12 Digit Desktop Calculator delivers speed and efficiency. The heavy duty, dual powered device features a wide, fixed angle display for easy viewing and large number keys for fantastic usability. 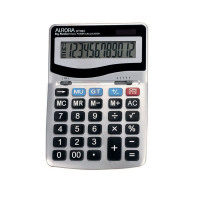 The high powered desktop calculator also features round up and round down options and the ability to select decimal places for increased flexibility.